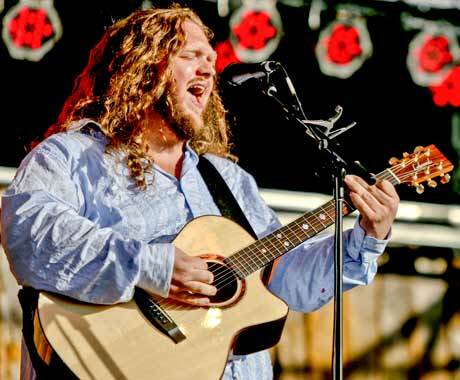 For his eighth LP, Weightless, singer-songwriter Matt Andersen employed a different songwriting approach. The New Brunswick-bred Andersen noticed a trend occurring in the writing of his previous releases and made a concerted effort to change things up. "[On] a lot of my songs, before [2011's Coal Mining Blues], I use the word 'I' a lot, which was great; it's how a lot of people write when they start writing songs as these songs come from a place you know," Andersen tells Exclaim! in an interview. "But I've become more aware of, not necessarily making the songs more accessible, but moving away from a 'Me, me, me' vibe and trying to bring in a global feel to the songs; songs that people can relate to." Andersen's newfound desire to increase the reach and appeal of his songs may have come at a perfect time. He recently signed to True North Records, and Weightless will serve as his first album with a full, label-supported international release. "We're hoping to reach more people," he said, adding that "with the new management and record label I have, it's become something we're talking about more and more." Though Weightless may bring increased attention to Andersen, he's fully aware of the possible pitfalls that exist when writing for a broader audience and also touring more and more. He's currently in the middle of an extensive solo, acoustic-based tour that will see him on the road until July. "Whenever you go anywhere, you look for pieces of home. And I find that the more you travel, there are no experiences that are yours and yours alone. There's always something that someone else can be attached to as well." Weightless is out now through True North Records. Find Andersen's tour dates here and read more of Exclaim! 's new feature on Andersen here.